On September 21, 1937, Japanese planes bombed the capi­tal of China, Nan­king, shortly after igniting the Second Sino-Japa­nese War. Presi­dent Franklin D. Roose­velt expressed the shock of “every civil­ized man and woman” over “the ruth­less bombing” of Chinese civil­ians. Gen­er­ally, how­ever, U.S. and Euro­pean reac­tion to Japa­nese aggres­sion in China was mostly bark and no bite. Just under two years later, Adolf Hitler’s Luft­waffe bombed the capi­tal of Poland, War­saw, launching (as the Euro­peans viewed it) the Second World War. But again, with the on­set of the so-called Phony War in Octo­ber 1939, there was lots of barking and little action. Not until Hitler turned his atten­tion to west­ern Europe and wolfed down Den­mark, Nor­way, the Nether­lands, Bel­gium, and France between April and June 1940 was the bark of the last dog standing—Great Brit­ain—matched with bared teeth. Back in Asia, the Japa­nese govern­ment and the Ger­man puppet regime of Vichy France signed a treaty in mid-Septem­ber 1940 per­mitting the sta­tioning of Japa­nese forces in parts of north­ern French Indo­china (in what is now Viet­nam). Four months later, at the end of Janu­ary 1941, Japan threw its weight behind a nego­ti­ated end to clashes between Vichy French and Thai forces along their con­tested border. The Japa­nese-im­posed armis­tice not only con­firmed Japan’s mili­tary occu­pa­tion of French Indo­china (modern-day Viet­nam, Cam­bodia, and Laos), but it opened the Vichy colony to min­er­al and agri­cul­tural exploit­a­tion by Tokyo’s expan­sionists in what Japan was calling the Greater East Asia Co-Pros­perity Sphere under its leader­ship. Eco­no­mic col­lab­o­ration was for­malized by treaty in early May. On this date in 1941 Japan cemented its rela­tion­ship with Vichy France by moving air and naval forces into south­ern Indo­china and declaring the whole French colony a Japa­nese protec­to­rate. Japan’s move set off a three-day whirl­wind of activity by West­ern govern­ments, which, in pro­test, froze Japa­nese assets in the U.S., Canada, Great Britain, Aus­tralia, New Zea­land, and the Dutch East Indies (modern-day Indo­nesia). The U.S. and the Dutch govern­ment-in-exile, which both con­trolled vast oil reserves, upped the pain by halting ship­ments of oil and motor fuel to Japan, turning off 80 per­cent of Japan’s oil imports. The next moves by Japan’s military were predictable. 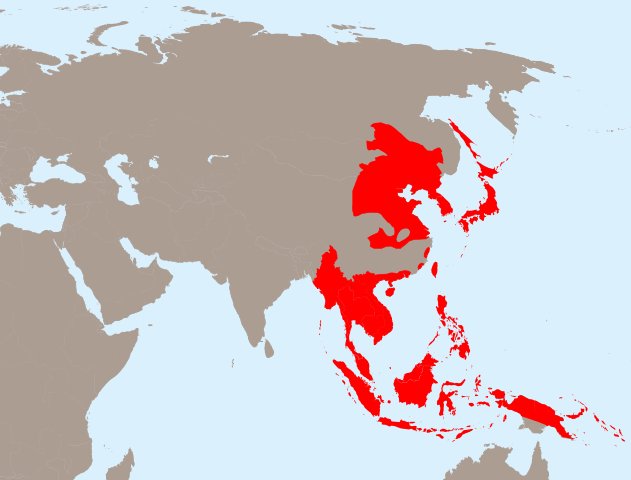 Above: Maximum extent of the Greater East Asia Co-Pros­perity Sphere, 1942. Based on a geo­graphically smaller ver­sion called the New Order in East Asia (late 1938), the Greater East Asia Co-Pros­perity Sphere was in­voked into being in late June 1940. Japa­nese idea­lists, nation­al­ists, econo­mic expan­sionists, and the mili­tary were all drawn by varying degrees to the “Asia for Asians” con­cept. Prin­ciple actor in the cast of players was the mili­tary, whose role was to secure by con­quest the raw mate­rials that were unavail­able on the home islands. Although Japan suc­ceeded in stimu­lating anti-West­ern senti­ment as “elder brother,” the Co-Pros­perity Sphere never materi­alized into a uni­fied East Asian block econo­mically or militarily. 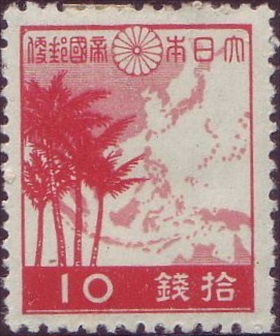 Left: Japanese 10-sen (1/10th of a yen) stamp from 1942 depicting the Greater East Asia Co-Prosperity Sphere. Right: Six “independent” participants and one ob­server attended the Greater East Asia Con­fer­ence, a sort of Asian sum­mit held in Tokyo in early Novem­ber 1943. 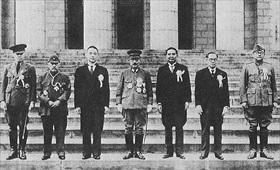 Standing in front of the Japan­ese Diet, or national par­lia­ment building, are (left to right) Ba Maw, head of Japa­nese-occupied Burma (State of Burma); Zhang Jinghui, Prime Minis­ter of Japan’s pup­pet state of Man­chu­kuo (Man­churia); Wang Jing­wei, head of the Japa­nese pup­pet govern­ment of China (Reor­ganized National Govern­ment of China); Hideki Tōjō, Prime Minis­ter of Japan; Prince Wan Waitha­yakon, envoy from the King­dom of Thai­land; José P. Laurel, Presi­dent of the Japa­nese-spon­sored Second Philip­pine Republic; and Subhas Chan­dra Bose, Head of State of the Provi­sional Govern­ment of Free India (the “obser­ver,” since India was still under British rule). In a joint decla­ra­tion, the parti­ci­pants praised Asian soli­da­rity and con­demned West­ern colo­nialism but could not pro­duce any prac­ti­cal plans for either eco­no­mic develop­ment or inte­gration. The Co-Pros­perity Sphere col­lapsed with Japan’s sur­render to the Allies in August 1945.